The view of from Chicago Avenue reveals the drafting room (left) and client meeting room of Wright's Studio Annex. Blades are frowned upon by the Foundation, but it is well worth the time to explore the Home and Studio Annex. 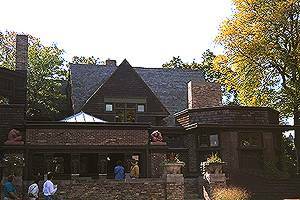 Tour online with Wright in Oak Park and with the official web page Frank Lloyd Wright Home and Studio Foundation.